Most Mac users are best served by using the easy Migration Assistant tool to copy all files, folders, preferences, and login data from one computer to another. This isn’t always an option though, perhaps because a hard drive is failing, or maybe you just prefer to manually migrate only very specific data from an old Mac to a new one. Keychain login data and keychain passwords can be copied from one Mac to another Mac manually this way, if need be. Aimed at advanced users, this article will focus on transferring all passwords and login information you have stored on one Mac to another Mac, effectively transferring all crucial login data that is handled by Keychain. 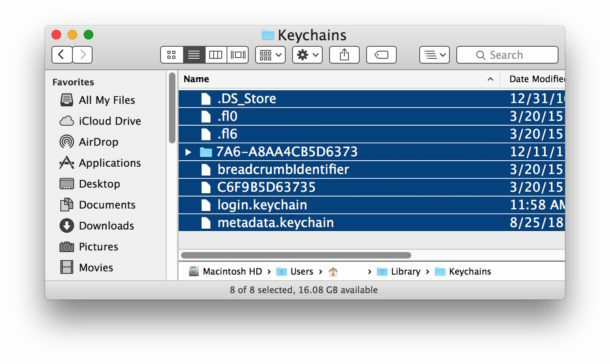 With the keychain data imported, all of the stored logins and passwords from the old Mac should be imported into the new Mac and ready to use. You can test it by going to a web page or app where password data is typically stored and verifying that it is automatically entered. If you have problems with Mac OS X not remembering passwords after importing the old keychain, use the Repair feature in Keychain Access to get everything back to normal. You can copy the keychain data from one Mac to another Mac using just about any method you want to transfer the data, whether that is AirDrop, a wired network connection with SMB or AFP sharing, ssh or scp, a USB flash drive or external hard drive, or any other similar data transfer mechanism. Changing USERNAME to the user name of the individual who owns the keychain file. You can transfer and copy Keychain data from various computers this way by finding the keychain data files and copying them to other machines. Finally, if you used external media like a USB drive to transfer the keychain file, you will probably want to go manually delete that since it’s never a good idea to have login information floating around, particularly on any unencrypted drive or volume. If you are starting with a brand new Mac I would highly recommend Migration Assistant, it’s hands off and flawless. I total agree with vna. I had to sell my old mac before my new one came. At the last minute I did a backup using time machine and wiped my old mac and shipped it off. Days later when my new mac came I restored using Migration Assistant with my time machine backup and it was like I never left. Flawless. Try doing that with a PC. Not happening. Sometimes Migration Assistant is not an option, especially when jumping several revs of the OS, like say going from Tiger to Mountain Lion. This is helpful information. Trust me on this. I agree also you get plenty free space and leave all other system issues behind. I just downgraded from 10.10(buggy and losing support for drag and drop in many places) to 10.9 and now I have issues here and there. I will probably reformat transferring “Application Support” selected files from “Preferences”, “Keychains”, “QuickLook” and “PreferencePanes” Library folders. Then you get only what you need and a bunch of space :). I’v been doing this since Tiger and it keeps your system as fast as out of the box. Some apps that fill your system with burdens like Adobe’s will need to be reinstalled though. Hi, I’m setting my mac book pro back to factory settings as it has 196GB in ‘Other’ under storage, and no matter how many files I delete the other goes no where. A nice guy at apple suggested returning to factory settings as it will then remove the layers that apparently build up when you update OSs, my macbook pro is 2009, so lots of updates in it’s time. I’ve backed up all my personal files and iTunes, iPhoto libraries but now getting a bit confused as to which others to backup and restore to the computer. I’m going to pinch your list above but would you recommend any others? Obviously I can’t use migration as it would take all the crap with it i’m trying to leave behind. LIFESAVER! What a great App! Transferred all my UN/PW info saved from older 2010 MacBook Pro to my new SSD MacBook Pro within seconds. Migration Assistant wasn’t really an option for me because there were tons of stuff I really didn’t want to transfer and clutter up drive space. I’ve been transferring only files and programs needed. Time Machine back up was also WAY TOO big and again, trying to avoid clutter of files I hadn’t opened in a long time. This App is awesome! Attempted to delete an imported keychain and could not find the Library folder under my user path. Went to view – show view options – clicked on show Library folder as it was by default hidden. Does anyone have any idea how I can recover my keychain from backup? My hard disk had to be replaced and my backup isn’t showing Keychains in the backup when I type the path ‘~/Library/Keychains/’ – only brings up the Keychain on the new hard drive. In fact, my backup doesn’t show a Library folder at all in the same location as it appears on the new hard drive. Help would be really appreciated – too many Safari passwords to remember/replace otherwise. Restore your Mac from the Time Machine backup and Keychain would go with it to the new Hard Drive. The contents of Time Machine volumes are not meant to be user accessible beyond Time Machine, the ~/Library/Keychains/ folder is your root hard drives personal user home library, that’s why you aren’t seeing the backup there. Is there a means of accessing the ~/Library/ folder from previous backups? I’m trying to set up a new mac (single SSD) by merging the data from my previous mac (dual HDD + SSD), and so need to restore the keychain folder. (Startup disk was in SSD while Home folder/etc was in HDD). I’m desperate and would really appreciate some advice. If you’re trying to access the login.keychain file, it is hidden by default. I used the terminal command to unhide the file and then was able to copy the keys to my new machine. Do NOT follow these instructions unless you want everything added. Now I have to figure out how to undo this f-ing mess! Did you not read the article? Of course it copies “everything”. Yes you’re copying the keychain logins and passwords, both plural, to another Mac. That is the entire point. If you want to selectively copy a single password or login, you would need to export it, but why do that when you can just login on the new Mac? The whole point of this is to ease the transition by copying every login. You can also use iCloud Keychain now to sync a keychain between Macs, which is easier for most users, but it requires iCloud of course. Syncs to iOS devices as well. What do you mean when you say “ser” here? > What do you mean when you say “ser” here? This method no longer works with Mojave. That is, copy keychain files from High Sierra system to Mojave system did not work for me. None of passwords are transferred over. This only works with locally stored keychain items to transfer passwords. If you use iCloud Keychain then this will not work as there are no locally saved password data, it is encrypted in iCloud instead. However, iCloud Keychain will sync all keychain passwords between Macs using the same Apple ID, so you can try that instead to gain the same copying effect of passwords and logins.